SINGAPORE ISLAND, STRAITS SETTLEMENTS, MALAYA, 1945-09-30. 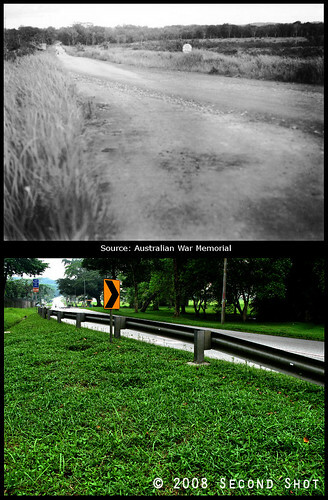 THE CHOA CHU KANG ROAD NEAR BULUM VILLAGE WHERE TROOPS OF 2/29 INFANTRY BATTALION SET UP AN AMBUSH AND REPULSED AN ATTACK BY THE JAPANESE ON THE MORNING OF 1942-02-10. 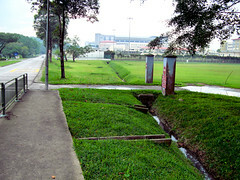 This is the original stretch of Choa Chu Kang Road outside Tengah Air Base (gate visible in the background, on the left). From second shot, the road has been widened, land taken from the left (airbase) side. Two reasons why I’m fascinated with the second shot. If you look carefully at the 1945 photo, just before the road becomes straight from the right bend in the foreground, a hump is visible (look carefully at the ‘kerb’ on the right). The hump has survived all the PUB work, if any, along the stretch and is visible in my second shot. Some of the Heritage Trees were planted in parks, along roadsides or in gardens many decades ago, while others may have been self-sown or are remnant forest trees that had been retained despite the rapid urbanisation of Singapore. My search for the remnant nutmeg trees inside the Istana was a failure. 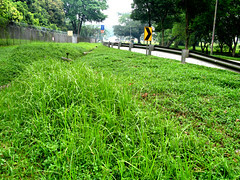 But I may have serendipitously discovered the remnant roadside grasses of Choa Chu Kang Road. Thus Keat Hong Camp has always been located along (original) Choa Chu Kang Road. Of historical interest are the remnants of an old gate opposite Tengah Air Base. I’m not sure what it was used for, maybe oldies like Peter can tell me. Today the land behind the gate is a playing field (you can see a goalpost in the previous photo). The ‘no entry’ and ‘protected place’ signs are still hanging on the gate pillar. What anachronism! I have previously blogged about my experience at the Istana Open House earlier this year. I took second shots (here and here), covered a bit of history and had a field day admiring the crowd waiting to enter the Istana. I did not get to shake the President’s hand unfortunately, because I was the early bird and according to Victor, the President only comes out during sunset. There was another purpose for my visit and that was to find the nutmeg trees that once graced the land which became the Istana Domain. A few nutmeg trees still grow in the grounds of the Istana. Clove and nutmeg trees in this part of the grounds recall the original Prinsep plantation. I was optimistic …. even though I can’t tell a nutmeg tree from a clove tree. I did not manage to find my nutmeg tree (or clove tree) in the end. But my flora search revealed some interesting plants. 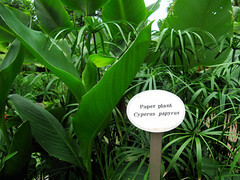 It was a surprise to find the Cyperus papyrus – Paper plant - in Singapore. I knew the ancient Egyptians used some kind of plant to make papyrus paper, but I didn’t know you can find it in Singapore. Today, the plant is cultivated not for paper but for ornamental purposes. In fact it is nearly extinct in its native habitat in the Nile Delta. A blood-stained yellow fruit? 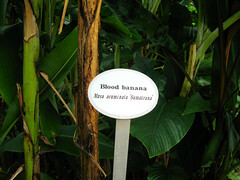 The Blood Banana is named for the dark red patches on its leaves (photo from far). The plant is ornamental and I read that its small fruit is “theoretically edible like any banana”, according to this wikipedia entry. 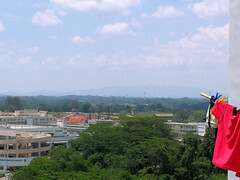 Jelutong is a tree grown commercially for timber. I read here that it can be tapped for latex as well. 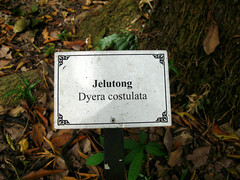 In the past, Jelutong latex was an important source of chewing gum. So I did not find my nutmeg tree. 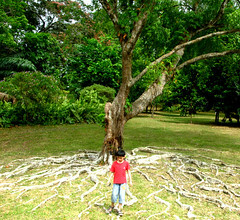 What a pity because such a tree may be a descendant or even a member of the original Prinsep plantation. If yg were there, he would be able to recognize one. In fact, he blogged about the few nutmeg trees in Lim Chu Kang. I think nutmeg trees are quite uncommon in Singapore. 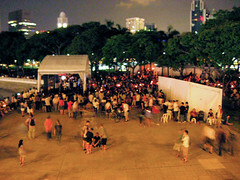 Judging from the media releases, Singapore’s Earth Hour event was a major success. Over 2000 people were estimated to have congregated at Esplanade Park where official festivities took place. I was one of them. I did not join in the obstentious display of public support. While I support (emotionally) others who took part, my personal view is that any public display is there to raise awareness. This objective has been met judging from Earth Hour in the news. In fact, while over 25,000 individuals signed up formally in Singapore, many thousands more were estimated to have taken part without having the chance to formally register for the campaign. These were the silent heroes. 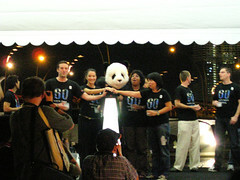 What is the real objective of Earth Hour 2009? You can read about using the light switch as your vote. For Earth Hour, I did my part by not staying at home (lights off automatically) and taking public transport (like I always do). Even my camera pledged her support by going out on me – the battery went flat. Most of the photos below were taken using my colleague’s camera. 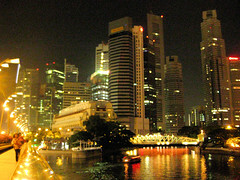 I brought him out to experience Earth Hour in Singapore. 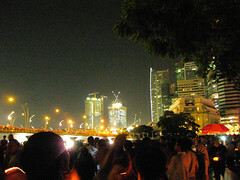 I was at Esplanade Park not for the candlelight picnic and concert by WWF, Nadya Hutagalung and Gold 90.5FM DJs. I was there expressly to “soak myself in total darkness” and to take before and after shots of the city skyline. If you were as naive as me, you would no doubt be disappointed. Car lights were still on and so were the road lamps. While the wish to soak myself in total darkness is exaggerated, my observation about the city skyline still brightly illuminated is not. On hindsight and after conversation with a friend, I surmised a reason could be the workers are paid hourly wages. Management willing but workers not, the paycheck comes before the candle. 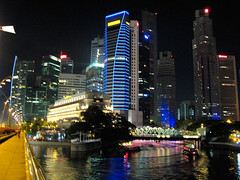 It was easier for Shenton Way to support Earth Hour which fell on a Saturday this year. I did not pay attention to the concert, but the panda sure caught my attention. It so happened my colleague came from China and the panda is as iconic to their country as the Merlion is to ours. Imagine seeing our Merlion on stage in another country. I can’t resist taking a photo of the plush toy. 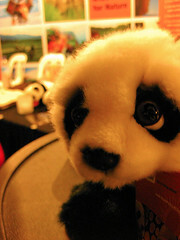 I think my colleague quipped about the panda looking ugly (哎哟，好难看). Or did he say cute (可爱)? 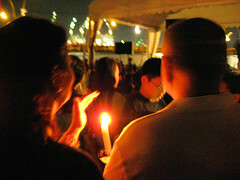 During Earth Hour, many supporters lighted their candles. I read they were beeswax candles and such candles reduce rather than add to pollution. 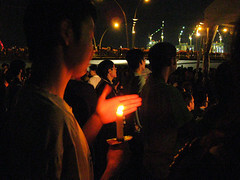 Lit candles are often used to express solidarity. As lights were switched off, it was akin to killing two birds with one stone. I observed the Flyer was in darkness. I read that Orchard Road too joined in the pledge of darkness, but to what extent I’m not sure. If you were there, perhaps you can drop me a note in the comments. Our dinner at Tony Roma’s subsequently was not in darkness. 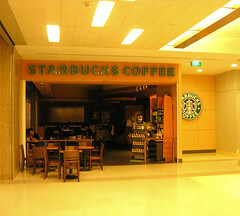 Not for these people at Starbucks though. Earth Hour is over, but you can still make your vote count at the Copenhagen Climate Conference in December. You can add your Earth Hour photo to Earth Hour’s flickr group (Earth Hour 2009 Global) and tag it with your city and country. 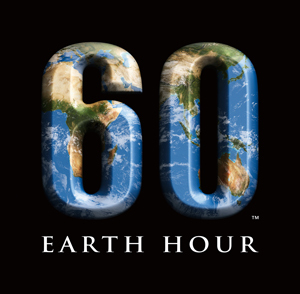 Or you can, like me, write a blog post about the event and tag it with earthhour or voteearth and your location. My amazing red dot quiz 2 was ‘brutally attacked’ by oldies trying to guess the location where the mountain can be seen in such proximity. I hope they had much agony fun deducing the location from clues in the photo. So far, Peter, yg, Chun See and Keith have got the answer correct in one way or another, but nobody scored full marks. Victor did not officially take part; he must have been too busy shooting himself in the mirror. Peter made the first breakthrough by recognizing the foreground as SAF area. The place is labelled Kranji Camp (at Lorong Bistari) on my street directory. His closest guess was the ‘provost in Kranji’. He could have meant Mowbray Camp or Kranji Camp at Lorong Kebasi. yj adopted a different strategy. He tackled the mountain instead. He hit the target by correctly identifying Gunung Pulai. But he didn’t answer the question which was about identifying my location. His latest guess was ‘Choa Chu Kang’ but I was looking for ‘Yew Tee’. Yew Tee today is at Choa Chu Kang North, separated by KJE from Choa Chu Kang housing estate. Chun See was the first to blurt out Choa Chu Kang. He did it without identifying the SAF area (Kranji Camp) or the mountain (Gunung Pulai). The quiz would have ended if I left it at that. But I was waiting for the magic keyword. Not open sesame but Yew Tee. Keith used yet another approach. He deduced the location from the golf course. I cannot spot the golf course in the photo but from my position, I don’t think Warren Country Club can be seen. His other guess, Kranji Country Club (more accurately Kranji Sanctuary Golf Club) may be right. From Yew Tee to Gunung Pulai: Straight line denotes light of sight to the mountain. The following photos were taken from Yew Tee block 679 and 680. Original quiz photo taken from block 679. 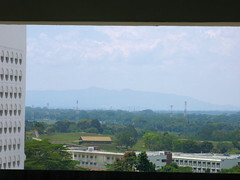 Foreground shows Kranji Camp. View from block 680. 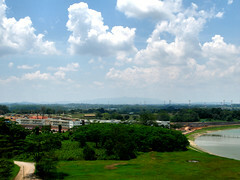 Sungei Kadut Canal on right. Do not be fooled by its smaller appearance here. The mountain looks larger in real life when viewed from the block. 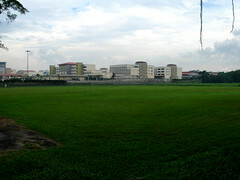 School of Logistics/Combat Service Support at Kranji Camp. You can see both names in the picture.